If you are starting to feel the urge for western food, or just feel like having a nice outing without having to leave central Beijing, we would recommend a visit to the Houhai Lake. Most part of the lake is surrounded by restaurants, bars and cafÃ©s, many of them offering both inside and outside seats during the warmer seasons. The widescreens are turned on during any larger sports events, and beer-drinking sports fans are gathered from every corner of the world to show their support in an orderly manner. Boats are available for hire if you feel like taking a relaxing trip on the lake. 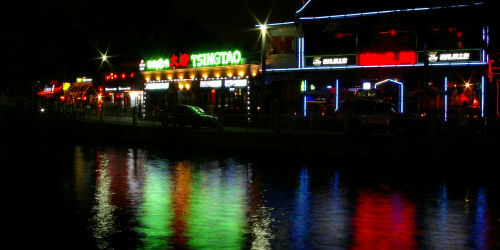 You can visit Houhai during the day, but it is really at its best in the night, when the restaurants are crowded with guests and the moon is shining above the lake. Houhai is mainly a place for relaxing and lounging. There are, however, shopping opportunities here too. The side street of Yandai Xiejie have some interesting and original light shopping.